Greetings potential new supporters! I wanted to go ahead and create this post to spread awareness of the fact that we need more consistent supporters to make the STEEM MARINES project successful. The STEEM MARINES is a very ambitious project which will bring opportunities to the Steem platform, and outside the Steem platform. Supporter upvotes will be used to fund everything needed for production, fund creation of promotional material, Commision talent within the Steem platform, and reward supporters. 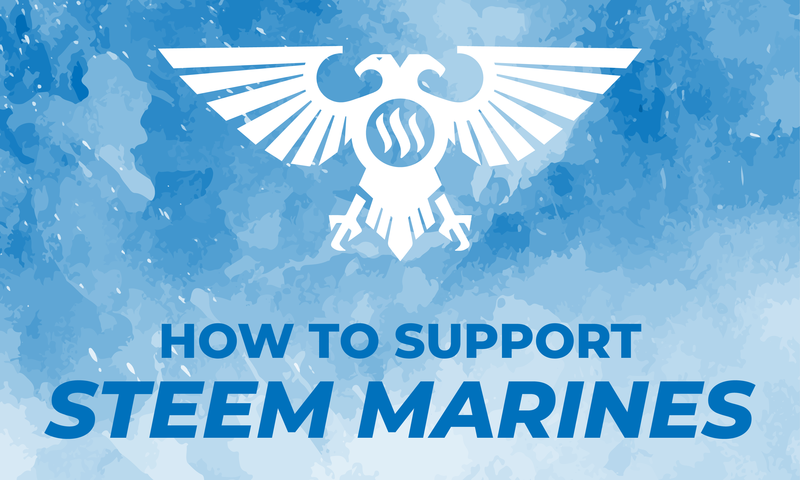 If you didn't know, STEEM MARINES aims to spread the word to the Warhammer hobby and competitive scenes, whilst creating a community of like minded individuals, all the while giving back to the supporters. I've created the 5 ways that STEEM MARINES will add value. Reccomend you check that out to see how you support will help add value to Steem. Now, I won't get into the rewards, since I haven't set it all in stone, but if you want to see the raw awesomeness I have planned, check this out. I'm going to really make sure to take care of supporters. In the very near future, I will be covering in great detail, what supporters will be getting in exchange for their support in greater detail. For verification on followings, We're going to be using Steem Voter. Go over to Steem Voter if you don't have an account yet. On the left hand side, you have the registration form, on the right, the login form. When registering for the first time, you will have to verify your identity using a transaction. It's pretty common to verify things this way. I know it sounds like a lot of effort, but it's extremely simple. Let me walk you through. Go ahead and open up Steemit.. Using your SBD BALANCE ONLY, Create a new transaction using the information given to you on your registration. And lastly, paste the nemo into the nemo field. Make sure you're copying the right nemo. 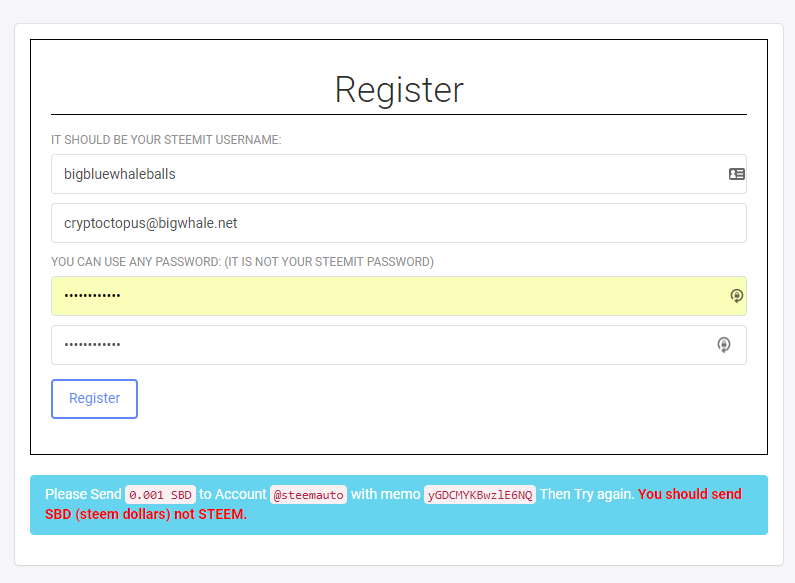 Go back to your SteemAuto page, and Click Register again, without refreshing. Your account should now be active. Go ahead and login to the right hand side using your registration info that you used to create the account. Welcome to Steem Auto! Proceed to Step 2! In the box here, type malicered and click follow. You are now officially a supporter of the STEEM MARINE PROJECT. Your vote weight is pretty much the percent you wish to autovote. You can configure that here. But you want to be a real big bro and keep it at 100. The next setting is the time your vote will be placed. If you want to maximize your curation reward, I'd say a number between 20-30, so you can get that big SP return. If you want to be a big bro and don't care, keep this at 0-5 so we can reach the frontpage faster. The next setting is important. Make sure it's green and says Enabled. Because red is bad, and green means winning. This is an optional step, but will help expose the STEEM MARINE content more easily. You should now be here. OPTIONAL: You can configure settings here just like you can before. Refer to step 2 for information. You are now part of the STEEM MARINES. Welcome aboard Sir or Ma'am. Early supporters are definitelly going to be rewarded heavily for this project, so if you're following now, congratulations and stay tunes as I will announce the rewards very soon. Make sure to join the discord server to find more information, Talk with me, and socialize with other supporters. Dialogue is completely open, share your opinions, what you think should happen, what I could do, anything. I will reply to your comments. The is one thing that I'm really looking for feedback on, so any feedback is gold to me. That's it for this post. Ultimately, we have gotten a lot of things that we're going to need. We still need to get some more stuff, I'll be sharing that with you guys in the next post. Please leave comments and share your thoughts. And be sure to join the discord server too! Also, if you don't mind me asking... but does anyone know what time @someguy123 upvotes these posts.. I'd love to get in just before him because he is a total boss. Thanks mate, love your work! Most of the posts that I upvote are low-reward, high creativity art. With some of the Niche posts from life or blog. I usually try to get the smaller users who I think have created high quality posts but no exposure. It's totally optional however, as the priority is securing the upvotes for the Steem Marine content for exposure and funding. If you can convince @someguy123 to autovote the Steem Marines content at say 32 minutes.... then you can advertise that everyone who autovotes at 30 minutes gets massive curation rewards... which is interesting to everyone on the platform, not just those into 40K. Surely 90% of the people upvoting Haejin are purely doing so you get in before ranchorelaxo. I wonder if we can set up an account that upvotes all related 40K content on this platform.... I'd very happily set a curation trail on that. It's a low level ask though. The post that was published there says that the Poles have arrived to the holocaust and it was Poland that camped death during the Second World War. This is not true. All those who have the courage to defend the historical truth, I am asking you to submit this web page and express your opinion in the comments under this shaking post. During World War 2, Poland was under German occupation. Many gods of death were built on its premises in which mass murders were carried out on Poles and Jews. Poland never supported German actions against Jews. Many Poles have become the sons after they saved hundreds of Jews during the occupation. They risked their lives to save the lives of others. Does the reward pay well, and after I donate the money. How will it improve and promote steemit.